Oil industry professionals rely on NACE International’s comprehensive collection of books, standards and reports. Unprotected pipelines, whether buried in the ground, exposed to the atmosphere or submerged in water, are susceptible to corrosion. Without proper maintenance, every pipeline system will eventually deteriorate. Corrosion can weaken the structural integrity of a pipeline and make it an unsafe vehicle for transporting potentially hazardous materials. As the world’s pipeline infrastructure expands and ages, industry experts and regulatory bodies agree that effective integrity management can reduce dangerous pipeline failures – saving lives, reducing downtime and optimising costs in the oil and gas industry. NACE International has released a collection of technical resources for oil industry professionals responsible for the protection of pipeline assets. 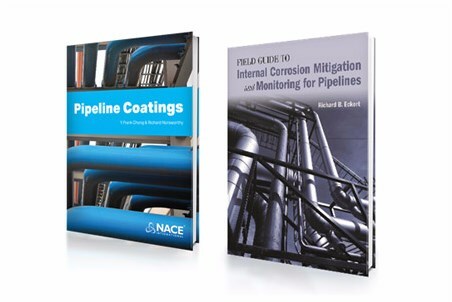 These books convey decades of industry knowledge, and provide practical tools to manage, prevent and mitigate corrosion in the oil and gas industry. These titles are now available in the recently redesigned NACE Store. Featuring easy sign-in and check-out, enhanced search capabilities and an intuitive design, the new site houses books, NACE standards, conference papers and more. This new title begins with a comprehensive history and description of various types of pipeline coatings and offers practical information on how to select, test, evaluate and compare different coating systems. The authors also discuss how coatings work with cathodic protection (CP)/CP shielding. This book is recommended for those who design pipeline or CP systems. Rick Eckert’s career in corrosion engineering has presented him with a wide array of experiences, from analysing metals in a laboratory to crawling on the inside of a pipe on the North Slope of Alaska to search for corrosion. Eckert draws on these experiences in his newest book, Field Guide to Internal Corrosion Mitigation and Monitoring for Pipelines. This book is intended to help oil and gas pipeline operators, corrosion professionals, integrity experts and risk management practitioners assess, control and manage the effects of internal corrosion on pipeline systems, thus improving the safety, reliability and integrity of their operations.